A Fast Start Could Make Melo's Decision Easy. Ladies and gentlemen, boys and girls, readers of all ages… it is time again for the start of the greatest time of the year. 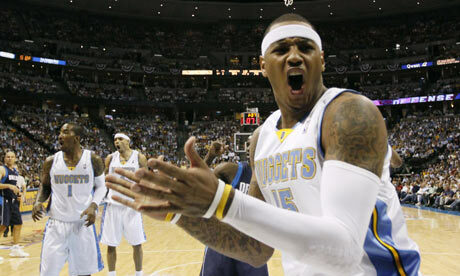 I am talking about the eve of the beginning of the Denver Nuggets season. That’s right folks, I am officially back from my sabbatical that took me away from writing last season. Unofficially, My Favorite Day of the Year! Today marks the day that myself, a grown man, wakes up before sunrise and starts getting ready for my favorite day of the year. Like a child on Christmas, peaking around the tree and shaking boxes, I am gearing up for the Nuggets’ season opener against the Utah Jazz. News this week coming out of Denver has been perplexing to say the least. The Nuggets let key reserve Linas Kleiza up and leave for Euro Ball, they have been trying to sign Anthony Carter back to the team, and are now actively pursuing the one dimensional services of Wally Szczerbiak. Many fans around Denver have been wondering how the Nuggets plan on repeating last seasons success along with building on it. Would there be any marquee deals? Who would we retain and who would we let go? What would we go after in the draft? There is a New “LAW” in Denver! Now the matchups are known, the schedule is set in stone (even if it means chasing off a WWE event from the Pepsi Center) and the Nuggets look to rumble on to the finals. Despite not getting much national press all season, the Nuggets now have the following of the NBA analysts and basketball fans. People are beginning to believe in our team and some are even coming out and publicly saying that they choose the Nuggets to win the series. John Berry went on record on ESPN today and predicted that the Nuggets will win in six. John Hollinger is using his PER system to also take Denver as his choice to be victorious but covered all of his bases and stated that “Bynum is the ultimate wildcard” and that his prediction is void with good play from the Lakers center. Sadly it has taken all season and two rounds of the playoffs for the Nuggets to get this much deserved attention.